Already spotted on GFXBench and AnTuTu, this upcoming flagship has just been teased on Weibo. The image reveals a dual-camera setup with a 16 MP and a 20 MP camera, complemented by a 2X optical zoom-capable lens. Oppo R11 is a handset that spent much time in the rumor mill, and now its launch is very close. Sadly, we have no precise date for its arrival, although it is imminent. We saw this 5.5-inch smartphone surfacing on GFXBench in the last month already, and now an official teaser confirms that the R11 uses a dual-camera setup. 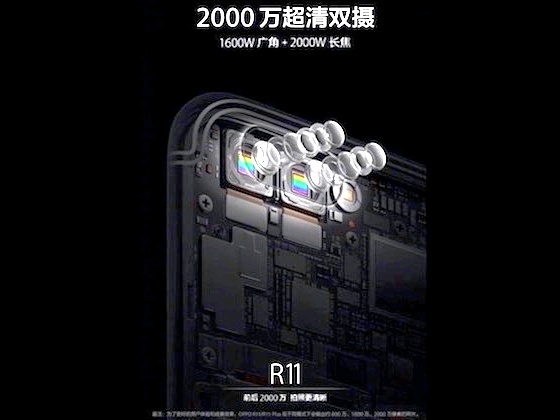 The official teaser images that surfaced on Weibo this week confirm two essential parts of the main camera setup: a 2X zoom factor lens and a premium dual-camera duo with a 16 MP and one 20 MP image sensor. There is also an AnTuTu listing posted on Weibo that reveals a Qualcomm Snapdragon 660 processor, 4 GB RAM, 64 GB internal storage, as well as Android 7.1.1 Nougat. The 5.5-inch display is expected to offer 1,920X1,080 pixels. On the other hand, a Plus variant is also expected to show up sooner or later. In addition to a slightly larger, QHD display, it is also very likely for it to offer the 5X zoom dual camera setup that Oppo revealed at MWC 2017 back in February.